Up until the age of about three, we are completely dependent on our parents to regulate for us. Development of self-regulation skills continues throughout our childhood and into our early 20’s. But because of our impaired executive functioning, some of us never develop the necessary skills to manage our emotions. This leads to all manor of attachment and relationship issues throughout our lives. 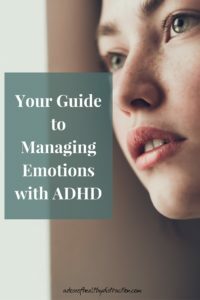 Managing your emotions with ADHD is not impossible, but it does require some self-reflection, acceptance, and support. But beware: self-awareness is not the same as self-criticism. I have a Why ——> What worksheet in my Anxiety and Depression workbook for this. In order to become more self-aware, you need to know who to ask for feedback. We are often completely unaware of how our body language and facial expressions are being interpreted by others. Work toward understanding what the ADHD diagnosis means to you personally. Once you understand the areas of your life impacted, you can get support specific to those needs. More on building authentic self awareness. Growing up, angry outbursts were common in our house. My brother and I were both ADHD, though it manifested differently in each of us. 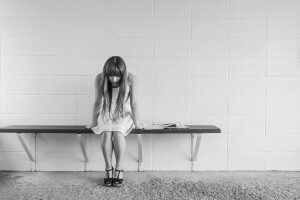 Our mother was angry, lonely, and at times verbally abusive. I don’t say this to insult her or place blame, she just didn’t have the tools to parent in any other way. My father was across town with his wife, working to support her needs and desires. As a young person I never experienced adult relationship role modeling. I had no idea what a healthy marriage looked like, or even how two adults talked to each other. Over time (and with professional help), I have been able to pull myself out of the emotional muck over the last 10ish years. It was a deliberate effort and I still work on it every day. See my post on Core Beliefs. Getting a diagnosis of ADHD can make us feel ashamed. So can talking to our partners about our emotional and/or sexual needs. Every time we try something new and experience mixed results we feel shame. Life is full of shame. And life with ADHD sort of magnifies that. I used to be that person that replayed conversations over and over in my mind for days afterward. Who am I kidding? I still do this. It’s called rumination, and it’s a tell-tale sign of anxiety. I also spend a lot of time worrying that my work, or my writing is going to be criticized publicly and then….what? I’m not sure. It’s just the fear of negative feedback that keeps me awake at night. Again, this a common anxiety-driven behavior. If you have ADHD you will probably deal with anxiety at some point. Check out my post on anxiety. We with ADHD are tough in relationships. Sometimes we don’t communicate well, other times we fail to appreciate how hard our partner is working. And we can be totally insatiable, you know? For every positive quality of ADHD – there is an equally troubling flip side. Believe it or not, we are more likely to be manipulated and/or abused in relationships because we seek approval. I am not a relationship expert, but I have figured out a few things. Relationships play a huge role in my FBF program as well, because other humans are important to our success. This sounds trite I admit it. Cognitive Therapy shows us that by changing your thought patterns you can change your functioning. For many of us the pattern of failure in our lives is stifling. When you cannot be productive at work, as a parent, or as a life partner you start to view the world through a very negative lens. I spent much of my life fulfilling my own negative self-fulfilling prophecies. It wasn’t until I chose to be positive while still acknowledging my faults that I was able to let the negativity go. As an added bonus I’m able to accept the faults of others more easily too. Handling the emotions that come along with ADHD and other associated conditions is a full time job. It is a lifetime of work for those of us who understand the struggle. While I cannot solve all of our problems, I can share my personal solution. A private, structured ADHD membership community for women. Click on the link below to learn more.